An ulcer is an open wound that can appear anywhere in the body, but generally refers to the type of open sore than can occur in the digestive tract. A gastric ulcer can cause pain, indigestion and other discomforts during mealtimes and after you eat. Most doctors will tell you to avoid spicy foods because they can irritate your stomach's lining even more. However, cayenne pepper, a spicy flavoring for foods, may actually have a positive effect on ulcers. According to a July 2006 article in "Critical Reviews in Food Science and Nutrition," gastric ulcers can be caused in part by a bacterium called Helicobacter pylori. 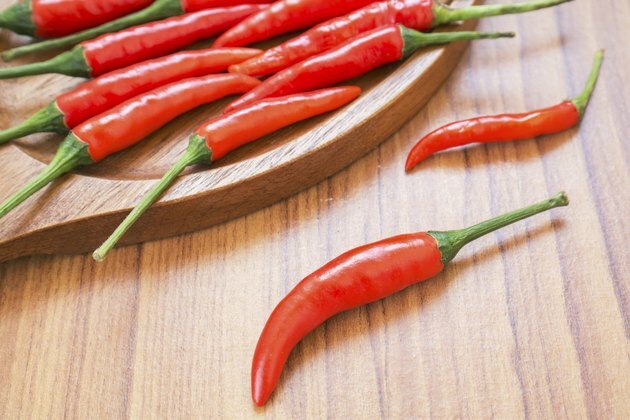 Capsaicin, the active ingredient in cayenne pepper, can effectively kill harmful bacteria that has infected the stomach lining, including H. pylori. The elimination of non-friendly organisms from the digestive tract can reduce your likelihood of developing an ulcer. Cayenne pepper can both prevent and ease the pain of ulcers by regulating your stomach secretions. Capsaicin, the compound that gives cayenne pepper its heat, can act as a natural pain reliever. The compound can also stop your stomach from producing acid which can irritate an ulcer. Cayenne pepper also tells your stomach to produce more protective juices that may prevent an ulcer from forming in the first place. The website YourCayennePepperGuide.com explains that the spice can relieve heartburn, indigestion and other digestive complaints that can be associated with an ulcer and other gastrointestinal discomforts. As with any supplements or alternative medicinal treatments, consult your doctor before you use cayenne pepper as a remedy for ulcers or heartburn.